What determines how many passes you need to make? My understanding is the weld needs to be the same profile as base metal. There is a lot that goes into determining the number of passes. First and foremost, you have to review your WPS to see what the minimum or maximum pass number requirements might be. When the WPS does not specify then you're free to use as many or as few as your skills allow. *Travel Speed - The higher the travel speed, the lower volume of weld, the more individual passes needed. *Weave Width or Oscillation - As with Travel, the smaller the weave the lower the volume and the higher the required number of individual beads. *Joint Configuration - All other parameters the same, a bevel groove will need more passes then a V- groove. *Electrode Diameter and Wire Feed Speed (WFS) - Again, all other parameters the same, larger diameter electrodes or higher WFS will increase volume per pass and decrease the overall number of passes. A 3/8" Welder Qualification plate test completed in the 1G (flat) position might be done in as few as 2 passes, or, in as many as 7 or more. Either can be perfectly acceptable welds made by a skilled Welder. That same joint in the 2G (horizontal) position would probably require a minimum of 4 passes and may take as many as 9-10. 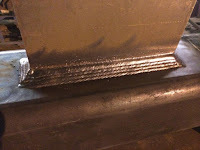 Same weld quality, just different Welder technique and comfort level. Same joint in the 3G (vertical) would typically take a minimum of 3 passes but would be of equal quality if it took 5-6 passes. Code books typically limit minimum and maximum pass size. That is dependent on process, heat input requirements, material thickness and position of welding. I've given 1000's of Welder Qualification tests and I'm almost always asked, "How many passes do I use?" My response is always, no less then 3, and as many as it takes to insure the Groove is full, and has no more then 1/8" of Weld Reinforcement (Crown). Other then that, you're on your own.